BOSTON, MA - May 4, 2012 - May the 4th be with you! Mimoco, makers of the MIMOBOT® collection of designer USB flash drives and MIMOMICRO™ card readers, is celebrating Star Wars Day (May the 4th... get it?!) 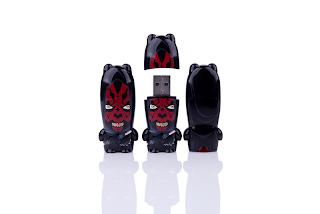 with a limited edition release of the deadly Sith warrior, Darth Maul in a run of 504 units. Star Wars Day was created by the Star Wars fan community to celebrate all things Star Wars, and with this limited edition Hooded Darth Maul MIMOBOT®, featuring his characteristic cape, deadly double-bladed light saber, and fierce yellow grimace, Mimoco is more than ready to honor this holiest of days. There is no better time to revisit one of George Lucas' most mysterious and compelling villains, especially following the theatrical release of Star Wars: Episode I The Phantom Menace 3D. Available in 8GB to 64GB capacities, Hooded Darth Maul MIMOBOT® lets you channel your emotions, (even the dark ones), as you store and transport all your digital music, pics, documents, and more. And with exclusive preloaded digital extras that include Star Wars-themed icons, avatars, screensavers, wallpapers, and the mimoByte™ sound software that plays authentic Star Wars audio clips when MIMOBOT is inserted or ejected from your computer, your limited edition Hooded Darth Maul MIMOBOT will make this May the 4th the best Star Wars Day ever! Lucasfilm, Star Wars™ and related properties are trademarks and/or copyrights, in the United States and other countries, of Lucasfilm Ltd. and/or its affiliates. TM and © Lucasfilm Ltd. All rights reserved. All other trademarks and trade names are properties of their respective owners. Boston-based design house Mimoco® fuses the art of contemporary characters with the functionality of personal data storage devices and is well known in both the pop-culture driven Art Toy underground and the high-tech electronic world. The MIMOBOT® and MIMOMICRO™ USB flash drive and card reader lines include original characters and licenses from Star Wars™, Hello Kitty®, Transformers®, and DC Comics®, to pop-artists like tokidoki®, David Horvath, and FriendsWithYou. MIMOBOT USB flash drives are available in up to 64GB capacities, are Mac and Windows compatible, and include preloaded bonus Mimory™ content. Learn more at www.mimoco.com. Happy Star Wars Day from Mimoco! May the 4th Be With You!